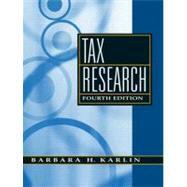 This text covers the most up to date tax research students need to know from a practitionerrs"s perspective. Treasury interpretations, overview of tax procedure, judicial interpretations, communicating research results, and the internal revenue code. For the tax practitioner. Barbara Karlin is Professor in the School of Taxation and Vice President for Academic Affairs at Golden Gate University.